Swiss third seed Stan Wawrinka overcame a mid-match lapse to beat Tomasz Bellucci 6-3 6-4 3-6 7-6 (7-1) and reach the US Open last 32. The Australian Open champion went a break down in the fourth set, but recovered with some fine shot-making. Earlier, fourth seed Agnieszka Radwanska became the event's first high-profile casualty, losing 6-3 6-4 to China's world number 39 Peng Shuai. The Pole has failed to advance beyond the last 16 in nine visits to New York. Fifth seed and 2006 champion Maria Sharapova survived the loss of the first set to see off world number 95 Alexandra Dulgheru 4-6 6-3 6-2. But American 21st seed Sloane Stephens also suffered a shock defeat, beaten 5-7 6-4 6-2 by Sweden's Johanna Larsson. Wimbledon semi-finalist, and Sharapova's off-court partner, Grigor Dimitrov made easier work of his second-round tie, dispatching American Ryan Harrison 6-2 7-6 (7-4) 6-2 in a little over two hours. After her second-round win over Madison Brengle, Sabine Lisicki has served both more aces (20) and more double faults (18) than any other player in the women's draw. Poland's Jerzy Janowicz joins American John Isner at the top of the service speed standings after delivering a 140 mph rocket in his win over Dusan Lajovic. Two-time champion Venus Williams, seeded 19th for in this year's draw, made the third round for the first time in four years as she beat Switzerland's Timea Bacsinszky 6-1 6-4. The American will play Italian 13th seed Sara Errani next. "Missed opportunities," said Stephens. "I didn't take advantage of the times I could have. That's definitely something I will look back on, but I won't dwell on it too much. There is room for improvement and I can do a lot of things better." "The conditions were extremely tough today. The heat, the wind, and facing Lleyton for the first round, it's nothing that you really want to have," said Berdych. "But otherwise, when you are prepared and feel good, that's a perfect start." "We started under the sun and finished under the lights," said Sharapova. "It was tricky conditions, a tough opponent so I'm very happy I was able to come back and come through and win this match." "I feel like I play my best when my opponent pushes me really," said Williams. "Once we start to, you know, really start to get into a slugfest, I feel like I really relax. Sometimes I feel like when they aren't pushing me as much maybe I'm a little too passive at times." 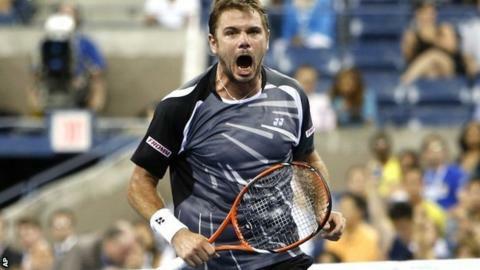 "I tried to focus more on my game and not on what he was doing,'' Wawrinka said. "I was playing a little bit smarter at the end of the match." Wawrinka's next opponent is Blaz Kavcic of Slovenia, ranked one place below Bellucci at 92 in the world. "I didn't play bad today," said Radwanska. "I think it was just her day. Of course I could do something different maybe or try something else, but I really tried my best and I was fighting until the end. I just couldn't do it." "I started a little bit too slow, but then I started to be more aggressive and hit the ball," said world number two Halep, who won in 56 minutes. "I feel great now that I could win so fast because it's so hot outside." "She wasn't an easy opponent. She's young and hungry," said Wozniacki. "She didn't have anything to lose, so she was going for her shots." The former world number one will play Germany's Andrea Petkovic, who she beat in the 2011 quarter-final, in the next round. After defeat to Romania's Sorana Cirstea in the first round of the singles draw, Heather Watson was dealt a similarly swift exit in the doubles as she and Spanish partner Silvia Soler-Espinosa were beaten 7-5 6-3 by American pair Alison Riske and Coco Vandeweghe. Ross Hutchins, making his return to the US Open since being diagnosed with Hodgkin's lymphoma, a form of cancer, in December 2012, secured a surprise win in the mixed doubles. The Londoner and his Taiwanese partner Yung-Jan Chan beat fourth seeds Daniel Nestor and Kristina Mladenovic 7-6 (7-5) 3-6 (10-6). Jonathan Marray, Britain's Wimbledon men's doubles champion in 2012, fell in the first round as he and partner Gilles Muller were beaten 6-4 3-6 7-6 (7-5) by Australians Sam Groth and Chris Guccione. Combining her tennis with training for November's New York marathon is working well for Caroline Wozniacki who has won 15 of her last 18 matches: "So it's only a positive when you go out on the tennis court. You know you can run out there all day if you want to, if you need to." "It's always a good sign that I don't have much points to defend, so there's always a good side the next year." Agnieszka Radwanska finds a positive after extending her poor record at the US Open. One brave journalist asks Lleyton Hewitt if he'll be back next year: "Don't know. Get that asked every week. Don't know. I haven't even thought about it." "He's like, 'Hey, you're that tennis player'. I'm like, 'Oh, my goodness, Michael Jordan knows who I am'." After the basketball legend watched Roger Federer's match yesterday, Maria Sharapova reveals her own encounter with Michael Jordan "a few years ago randomly, unexpectedly, at an airport". "The less you think, it's easier. When you start to question yourself, 'What are my true goals in life?' 'What is my true motivation?' Then you start to question, 'Why am I doing this?'. I'm going to be 30 years old, and I'm still warming up like a 10-year-old kid." Ignorance is bliss for Ernests Gulbis on tour. "At the end of the day, they start to get a little bit drunk," Stan Wawrinka on the evening session crowd at the US Open, one of whom he told to "shut up" as he prepared to serve against Tomasz Bellucci. "It was OK. I had to talk to a few of them." Midway though a point in her match against Sasnovich, Wozniacki found her hair had become tangled in her racquet. The Dane did not let that stop her having an, admittedly unsuccessful, swipe at her next backhand. "Once it gets to a certain length sometimes it can get stuck in the arm or the racquet," Wozniacki explained. "You know, I still tried to hit the ball. And almost took my head off."